Newman’s Own Foundation President and CEO Robert Forrester with 2018 Foundation grant recipients Kids Can and NZ blogger Maria Foy. Newman’s Own Foundation, the independent foundation created by the late actor and philanthropist Paul Newman, is inviting New Zealand charities to apply for grants this year for projects focusing on childhood nutrition. Newman’s Own Foundation President and CEO Robert Forrester said the 2019 grants are designed to address this major issue could include initiatives such as school breakfast programs, food rescue and redistribution, nutrition education and childhood obesity and better food security. This year Newman’s Own Foundation has committed $225,000NZD in grants ranging from $25,000NZD – $50,000NZD for children’s nutrition projects across the country. In addition to these grants, $75,0000NZD will be made to other organisations around the country. 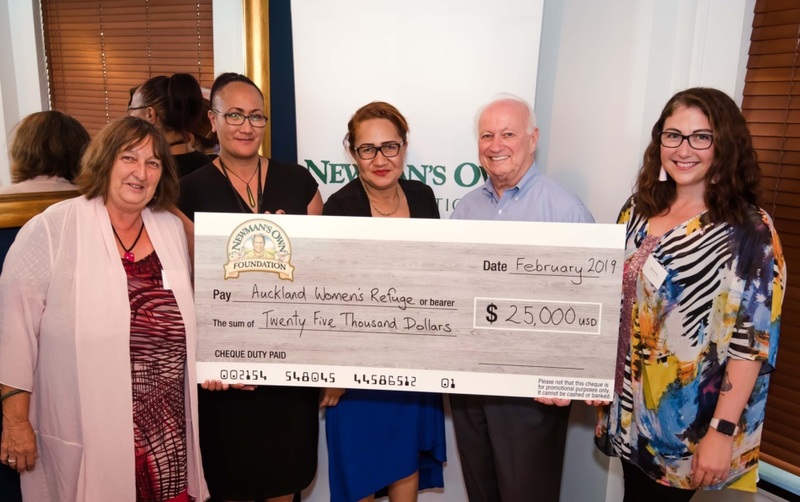 Newman’s Own Foundation President and CEO Robert Forrester with 2018 Foundation grant recipients Women’s Refuge and NZ blogger Maria Foy. Forrester visited New Zealand from 4-5 February 2019 to announce the 2019 grants programme and meet with the 2018 Foundation grant recipients, which included Kids Can and Women’s Refuge. Newman’s Own Foundation was created in 2005 by the late actor and philanthropist, Paul Newman, to assure his lifetime commitment to donate 100% of the profits made from the sale of Newman’s Own food and beverage products will continue after his passing. Since 1982, over $540 million has been donated to thousands of charities around the world, including New Zealand. In New Zealand, products are sold under the Paul Newman’s Own label. Newman’s Own Foundation Expression of Interest (EOI) details can be downloaded at http://paulnewmansown.co.nz from 4th February 2019 and close on 4th March 2019.